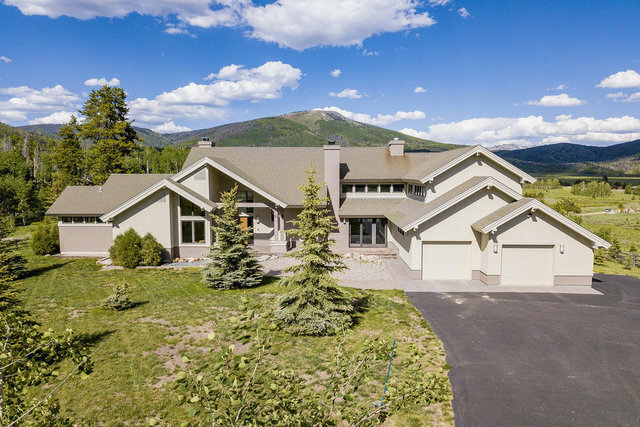 Luxurious modern home on 35 acres near Pearl Lake offering privacy and spectacular vistas in a serene mountain setting. The open floor plan is bathed in natural light through large windows that look out on to the surrounding mountains. The home is contemporary in style softened by the subtle use of free flowing curves creating architectural interest throughout the home. The great room is a lovely entertaining space complete with wet bar, wood burning fireplace, and access to a large outdoor patio. A cozy hearth room is set just off the kitchen, nicely appointed with granite counters, cherry cabinets and a large pantry. The spacious master is also on the main level offering a picture framed view of Hahns Peak, walk in closet and luxurious bath. Downstairs is the place for family entertainment with a full bar, game area, exercise room, and media alcove. Upstairs you'll find a perfectly organized office space with all the built in storage and desk space you could need. Also on the top floor is a bedroom suite and a large bedroom/bonus room currently set up as an art studio. The home offers an attached oversized 2 car garage and an additional 24x31 detached garage with a 12 foot door just right for the RV in the off season and all the toys you have to have when you live in a recreational paradise. 245 sq. ft. of storage underneath has a separate entrance. This garage is heated and plumbed with hot and cold water. The Preserve at Pearl Lake is a small enclave of homesites that share a common area that offers a large pond.